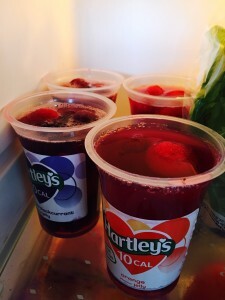 I get a bit bored of just jelly so it’s nice to add yogurt, fruit etc… so i make these lovely fruit jelly pots. 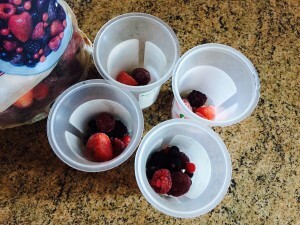 Place frozen fruit into the bottom of pots (you can also use fresh fruit but i find it keeps the cost down using frozen). 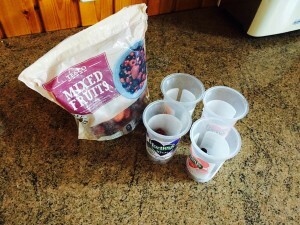 You can add as much fruit as you fancy.. but the more you add the harder it is for the jelly to set. Make up your jelly… Pour sachet into a jug or bowl and add 1/2 pint of boiling water. Stir thoroughly and then add 1/2 pint of cold water. 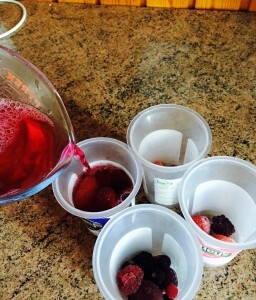 Pour the jelly mixture into the pots and then place into the fridge to set. 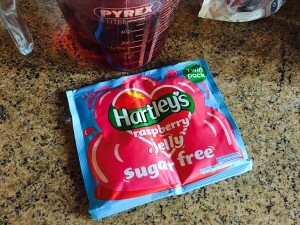 You may ask what the benefits are from adding the fruit to your jelly? Well i find that the jelly almost soaks into the fruit as it defrosts and makes it taste fantastic. Vivien Baird liked this on Facebook. Loretta McDonald liked this on Facebook. Such a good idea i will be doing this at the weekend! Instead of a sweet, this makes a great pickle. I dice a pack of vacuum packed beetroot, use half pint of boiling water to dilute a packet of blackcurrant jelly. Then a half pint of cider vinegar. Mix every thing, stick I’m the firdge till set.